or a copy can be requested at the same address. I believe those interested in the status of the ILC R&D programme will find this report very informative. An accompanying report on the ILC detector programme will be available in a few months. 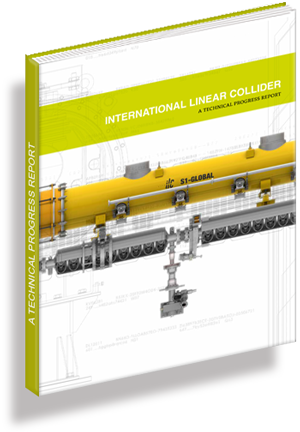 The International Linear Collider: A Technical Progress Report marks the halfway point towards the Global Design Effort fulfilling its mandate to follow up the ILC Reference Design Report with a more optimised Technical Design Report (TDR) by the end of 2012. The TDR will be based on much of the work reported here and will contain all the elements needed to propose the ILC to collaborating governments, including a technical design and implementation plan that are realistic and have been better optimised for performance, cost and risk. We are on track to develop detailed plans for the ILC, such that once results from the Large Hadron Collider (LHC) at CERN establish the main science goals and parameters of the next machine, we will be in good position to make a strong proposal for this new major global project in particle physics. The two overriding issues for the ILC R&D programme are to demonstrate that the technical requirements for the accelerator are achievable with practical technologies, and that the ambitious physics goals can be addressed by realistic ILC detectors. This GDE interim report documents the impressive progress on the accelerator technologies that can make the ILC a reality. It highlights results of the technological demonstrations that are giving the community increased confidence that we will be ready to proceed with an ILC project following the TDR. The companion detector and physics report document likewise demonstrates how detector designs can meet the ambitious and detailed physics goals set out by the ILC Steering Committee. LHC results will likely affect the requirements for the machine design and the detectors, and we are monitoring that very closely, intending to adapt our design as those results become available. There are too many people involved in important ways in the ILC programme to thank them individually. Nevertheless, I would like to express our ongoing appreciation of the support of funding agencies around the world, and of the major high-energy laboratories for their continuing support. I also want to note the importance of our oversight committees, the International Committee for Future Accelerators and the ILC Steering Committee, for their steadfast advice and scientific oversight, and of the Funding Agencies for Large Collaborations, both for their support of our common fund, and their ILC R&D resource oversight. Finally, as director of the GDE, I want to thank the dedicated group of accelerator scientists, engineers and technicians who continue to make such impressive progress in the face of the inevitable ups and downs of the overall project. This document is living proof!